Bible in the Basement: Pardoned! 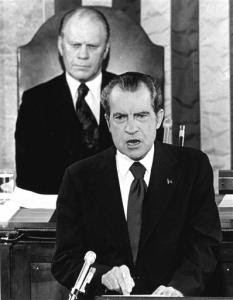 Lots of talk in the news this past week concerning the late Gerald Ford's pardon of Richard Nixon. Most of the TV opinion class seem to think it was a good idea - in fact, a courageous one. But in one opinion piece that swims upstream, Slate commentator Timothy Noah expresses his disdain for the pardon. "Why was Ford wrong to pardon Nixon? Mainly because it set a bad precedent. Nixon had not yet been indicted, let alone convicted, of any crime. It's never a good idea to pardon somebody without at least finding out first what you're pardoning him for. How can you possibly weigh the quality of mercy against considerations of justice?" Boy, this sure is fodder for a preacher! Apparently the idea of justice and mercy is alive and well in the American mind. And based on the above quotation, if we are going to understand God's mercy, we need to first stand trial and understand our guilt. PS: Makeshift, is this another answer to your question from Friday's post?